Sarkis Balyan and Agop Balyan. Sultan Abdülaziz (r. AH 1277–93 / AD 1861–76). Beylerbeyi Palace is a seaside residence in the Beylerbeyi district (formerly known as İstavroz Bahçeleri or 'Cross Gardens') on the Anatolian side of the Bosphorus Strait. The various parts of the palace complex have been put together independently, regardless of symmetry. The main structure, the palace building, is a two-storey brick construction rising on a high basement. 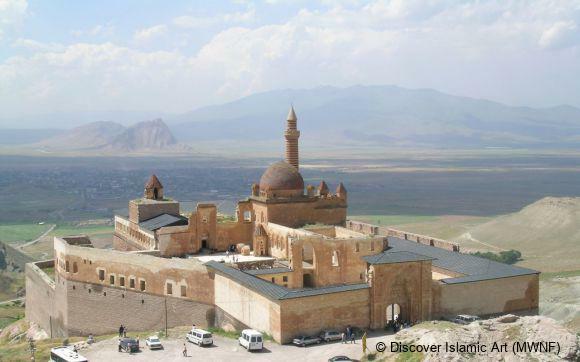 It occupies a rectangular area oriented north to south and measures approximately 65 m x 40 m. The southern section is designed as state apartments (mabeyn), the northern section as the family's living quarters (harem). 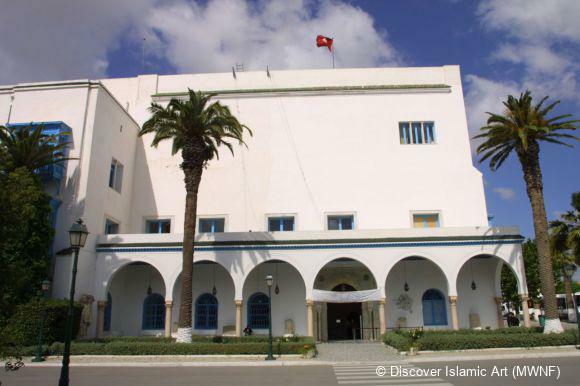 The main building has a symmetrical and axial layout; in contrast to the Western influence apparent from the outside, its plan resembles that of a traditional Turkish house, arranged around a central courtyard with iwans. The wall which runs along the quay, enlivened with repeating triple pilasters, includes two gates opening onto the water and two small seaside pavilions, one for men and the other for women. 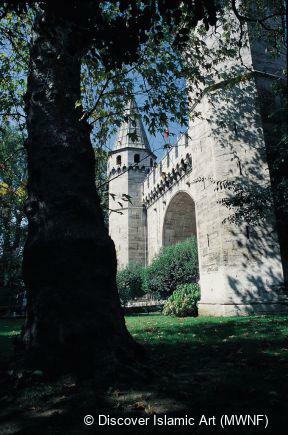 These splendid gates, called waterside or sea gates, were used to secure the entrance to the palace from the water. The sea gates, one of which was designed to belong to the men's quarters and the other to the women's, show Eastern influence; their design is interesting, enlivening as they do the two ends of the straight line created by the shore-side wall. The other buildings in the complex, dispersed throughout the complex within walled gardens and connected to one another by stairs and ramps, are the Marble Pavilion, the Yellow Pavilion and the private stables. The Deer House, Bird House, Lion House, the Pavilion of the Pashas and Music Pavilion are no longer standing. 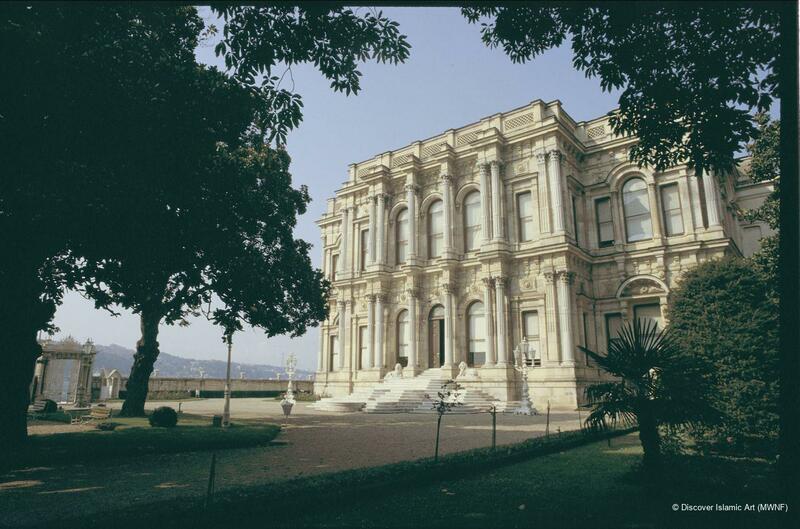 The façades of the Beylerbeyi Palace, like the organisation of the inner spaces, take eclectic forms. 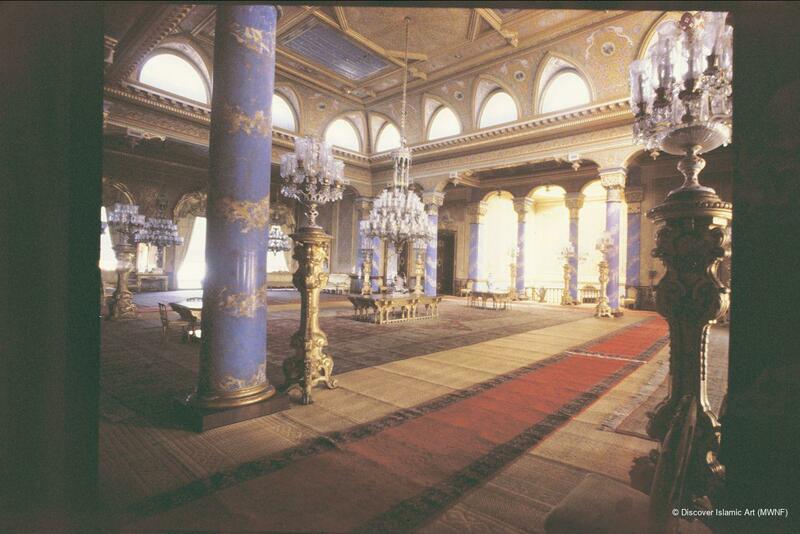 It is clear that Sultan Abdülaziz was inspired by his new palace and interested in its decoration. The façades include arches and windows in the Greek and Roman styles, a balanced Classical scheme is achieved also by the use of round arches and limited architectural forms; the plastic effect of Baroque designs is also apparent. In contrast to the evident Western influence seen in the external decoration, the interior spaces are heavy with traditional Ottoman and Eastern motifs. Many rooms and salons feature paintings of seascapes as well as military motifs like swords and flags. Since no provision was made for a heating system in the palace, it is inferred that the whole complex was designed as a summer palace. The first Beylerbeyi Palace was wooden and built for Sultan Mahmud II (r. AH 1223–55 / AD 1808–39 by the architect Krikor Amira Balyan. The present Beylerbeyi Palace was designed and built under the auspices of the architects Sarkis Balyan and Agop Balyan, and on the orders of Sultan Abdülaziz between 1276 and 1281 / 1861 and 1865, after the original palace was abandoned following a fire during the reign of Sultan Abdülmecid (r. AH 1255–77 / AD 1839–61). 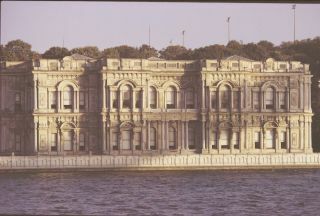 Over the years the Beylerbeyi Palace hosted many foreign guests; its last resident under the Ottoman Empire was Sultan Abdülhamid II (r. AH 1293–1327 / AD 1876–1909), who was dethroned. 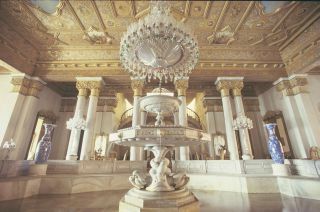 During the Republic period (after 1923) some sections of the palace were used to host state guests; these were opened to visitors in 1985 and renovated for various artistic activities. The Beylerbeyi Palace serves today as a palace museum linked to the National Palaces. One of the most magnificent Ottoman coastal palaces, Beylerbeyi Palace is located on the Asian coast of the Bosphorus. 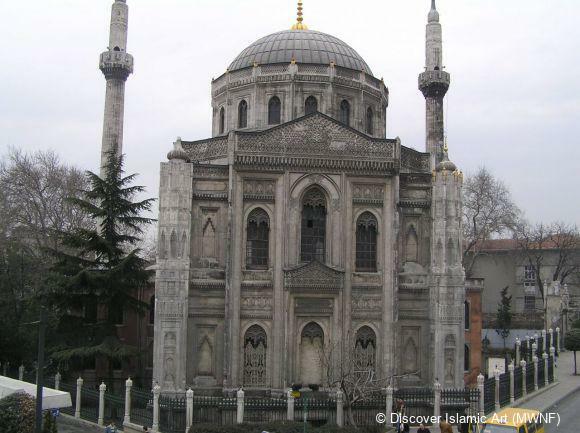 It was commissioned by Sultan Abdülaziz and consists of the main palace structure and its auxiliaries. 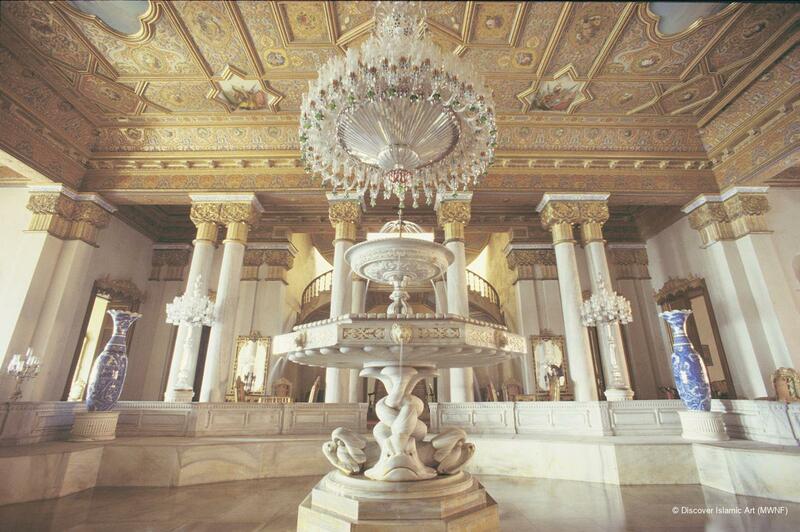 Its façade and interior decorations blend various Western influences with Eastern motifs. This summer residence is remarkable for its rich decoration and its two sea-pavilions on the water are the most striking and typical examples of Orientalism in Istanbul. It was opened to the public as a museum in 1984. Archival documents, inscriptions found on the monument, newspapers of the period, travel journals and the works of historians of the time are all useful in dating the monument. In addition, stylistic details of the palace complex provide important clues as to the period in which it was constructed. Batur, A., “Beylerbeyi Sarayı [The Beylerbeyi Palace]”, İstanbul Ansiklopedisi [Encyclopaedia of Istanbul], Vol. 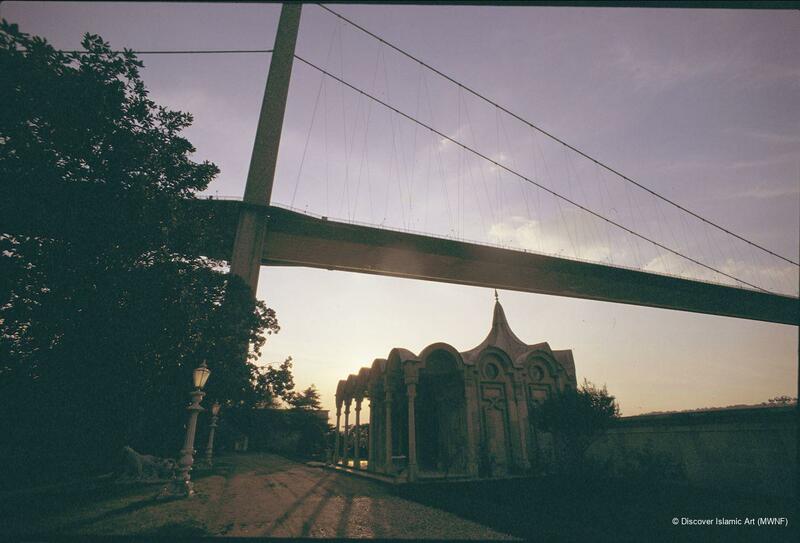 II, Istanbul, 1994, pp.206–10. Eldem, S. H., Boğaziçi Anıları [Memoirs of Bosphorus], Istanbul, 1979. Gülsün, H., Beylerbeyi Sarayı [The Beylerbeyi Palace], Istanbul, 1993. Karahüseyin, G., “Beylerbeyi Sarayı ve ünlü Konukları [The Beylerbeyi Palace and its Famous Guests]”, Milli Saraylar Dergisi [Journal of the National Palaces], II (1992), pp.126–41. Sözen, M., Devletin Evi Saray [The Palace, the House of the State], Istanbul, 1990.